Prepare for take-off ! 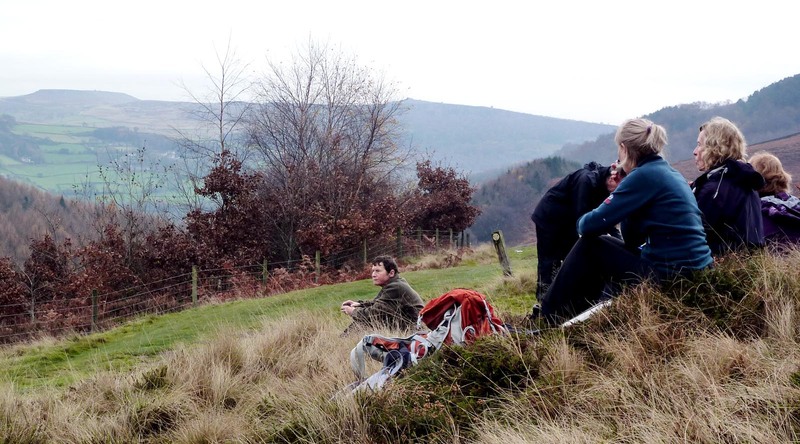 The walkers were buffeted by fierce winds on Kerridge Ridge. Starting from Riverside Car Park on the edge of Macclesfield town centre, the walk travelled through residential neighbourhoods in order to cross the Silk Rd by the timber footbridge. Moving on to Clarke Lane the group joined a footpath on the sharp bend beside Endon Lodge and climbed steadily through fields to reach Kerridge End where they swung north along the ridge towards the trig point in the teeth of fierce winds sweeping in from the Plain. They were therefore glad to take shelter behind White Nancy – a well-known local monument resembling a beehive which was erected by a local farmer in 1817 to commemorate the Battle of Waterloo. Last year it was painted with giant poppies to mark the 100th anniversary of the end of World War 1. After descending from White Nancy the route zig-zagged through muddy fields between Rainow and Bollington to re-enter the town and ascend a steep flight of steps beside Bollington Aqueduct where it joined the towpath alongside Macclesfield Canal. The ramblers followed the towpath back to the car park past Victorian mills, gaily-painted narrow boats and roving – or turnaround – bridges which were designed to enable horses to remain hitched to the narrow boats as they crossed over from one side of the canal to the other. 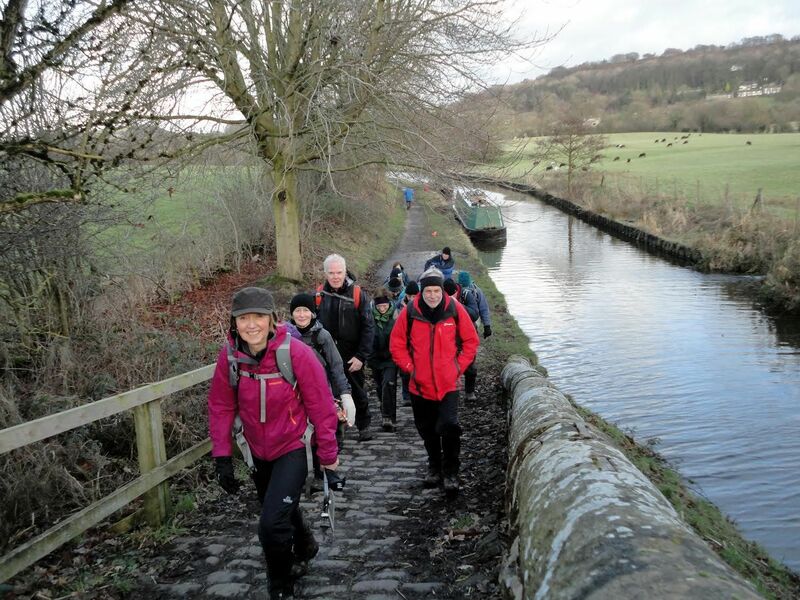 Caroline Finlayson leads the walkers over Macclesfield Canal on a ‘roving’ bridge. 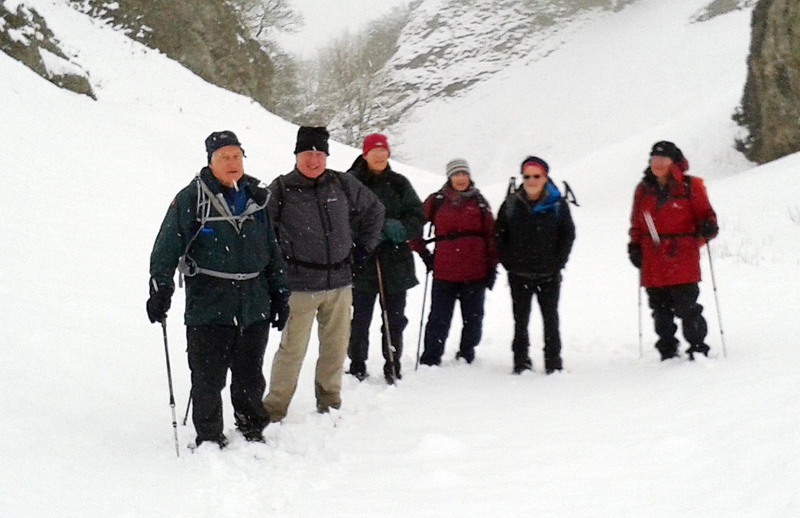 Seven (fool) hardy souls set off from Peak Forest on Tuesday 20th January. The snow had already started to fall before we set off up Old Dam Lane. Leaving the lane to cross the fields vision dropped to 100 metres due to mist and snow,and it was almost impossible to make out the footpath. The decision was taken to follow the country road into Castleton ,rather than getting lost in the mist over the fields. The road itself was impassable to traffic. As we descended into Castleton the mist lifted opening up a wonderful snow covered landscape. Castleton itself was almost deserted; unusual for such a tourist trap. After lunch we ascended Cavedale, arguably the most attractive dale in Derbyshire,and certainly one of the most challenging. Footprints in the snow indicated that there had literally been only one man and his dog before us all day. All the more surprising then to be caught up by a woman on Nordic skis.It really was amazing how fast she moved uphill. Eleven miles in the snow felt more like 15 miles in normal conditions. But at least we all got back safely,even though most of us slipped once or twice : the snow cushioning the falls. All in all quite an exhilarating day. Fairways Garden Centre at Sutton Lane Ends was the starting point for this eleven mile ramble. 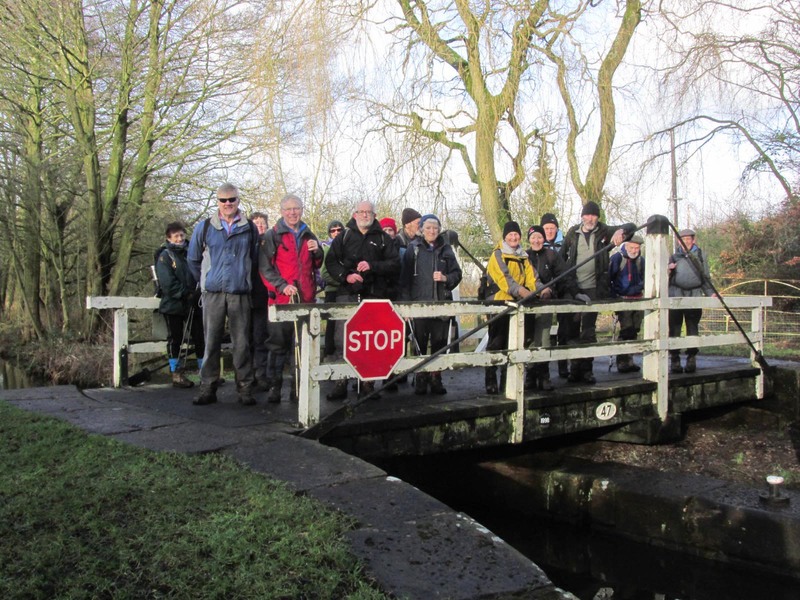 Sunny skies greeted the sixteen strong group who set off south via Parvey Lane to reach the frozen Sutton Reservoir which was built as a feeder canal to replenish the nearby Macclesfield Canal. Heading west, the group crossed fields to reach the parish church at Gawsworth and a convenient stop for elevenses in the shadow of the fine ashlar sandstone church. The present building dates from around 1430 and is a local landmark. It wasn’t our last visit to Gawsworth on this walk as the group headed south on a popular path before skirting around via High Lane and The Mollards to re-enter the village on the western side for lunch in sheltered Gawsworth Park. The village sign depicts a picture of a jester known as Maggoty Johnson who was jester to Gawsworth Hall and his grave is located at nearby Maggoty Wood. Another loop was made to the north of the village for the afternoon leg of the walk via Dalehouse Farm and Danes Moss Farm before crossing the Danes Moss Nature Reserve in low afternoon sunshine. Finally, the towpath of the Macclesfield Canal was followed back to the Fairways Garden Centre for a most welcome cup of tea and cake to round off the day. 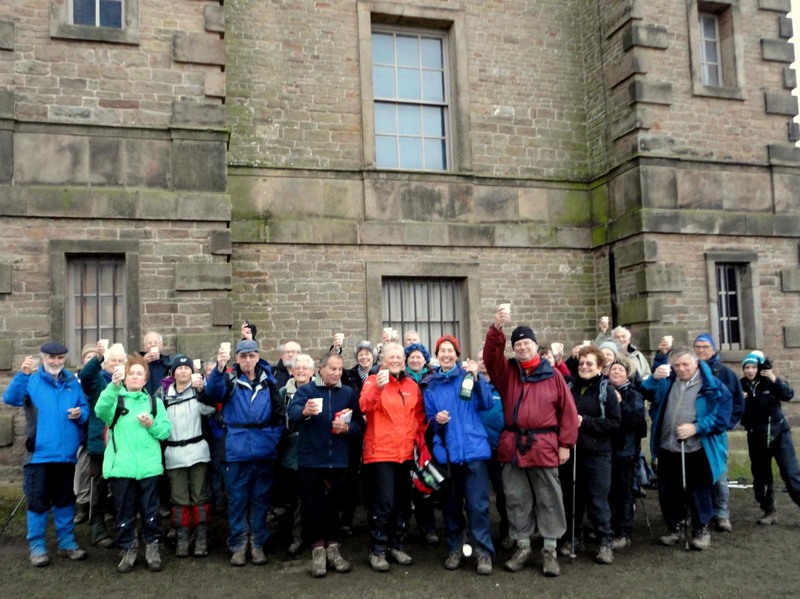 East Cheshire Ramblers celebrated the New Year with Keith’s ‘Sherry’ Walk – a 12-year-old tradition started by long-standing member Keith Hartley from Bollington, who has since stepped down from running the event but is still a regular attendee. Jointly organised by Lorraine Tolley, Melanie Davy and Jake Ezair, this year’s walk attracted a record crowd of 38 ramblers, including four new members, who set off from Jackson’s Brickworks, Higher Poynton, and made their way along the Macclesfield Canal and through farm fields towards Ryles Wood . After a brief pause for coffee at Parkgate, the party entered Lyme Park and climbed the incline outside Lyme Hall to reach the Cage where Lorraine and Melanie handed out beakers of sherry to toast in the New Year, accompanied by a generous supply of mince pies provided by Jake. Suitably refreshed the group then returned to Higher Poynton by heading downhill and crossing a footbridge to exit the park at Bollinghurst Brook and then following the Goyt Way along the brook to rejoin the canal back to the brickworks. From Andrew’s Edge with Lamaload Reservoir in the distance. The summit of Shining Tor, at 559m, is the highest point in Cheshire. It is situated on a fine ridge walk, popular with East Cheshire Ramblers, and affords superb views towards local landmarks, such as Shutlingsloe (506m) and ‘The Cat & Fiddle Inn’ on Buxton New Road. The ridge forms part of the border between Cheshire and Derbyshire, and follows an old packhorse route used to carry salt from Cheshire and lime and coal from Derbyshire. Shining Tor was the first of several high points on a recent nine mile walk, when twenty-two Ramblers set off from Pym Chair Car Park, led by Andrew Davies. After their gradual climb along the ridge and time to admire the summit vista, the ramblers descended steeply, tracking generally west then northward along Andrew’s Edge on rough grassland. They enjoyed a short break overlooking picturesque King’s Clough and Lamaload Reservoir, before continuing across rather boggy moorland to Redmoor Farm, then down and up a short steep stretch of road to Jenkin Chapel. A more gradual ascent on tracks and paths took them past Green Booth to Summerclose and Charles Head Farms, though they paused on the way for a picnic lunch gazing across the steeply-sided valley towards Windgather rocks, which they would reach later along their route. Soon they were once again descending steeply, this time to cross Todd Brook, before climbing more gradually on its far side past Near Carr Farm to Five Lane Ends. As the walkers turned south to walk along Taxal Edge and Windgather Rocks, the low sun to the west broke through the clouds, and faint shafts of sunlight against the mid-afternoon mist lent a rather mystical quality to the landscape. A final mile along this ridge brought the ramblers back to the car park, where all agreed it had been a very enjoyable walk. Mow Cop Castle folly is a landmark dominating the Staffordshire skyline for miles around. The folly, built 260 years ago and now belonging to the National Trust, was the location of the first stop of the day on a recent twelve mile walk by eight members of the East Cheshire Ramblers, led by Colin Park. 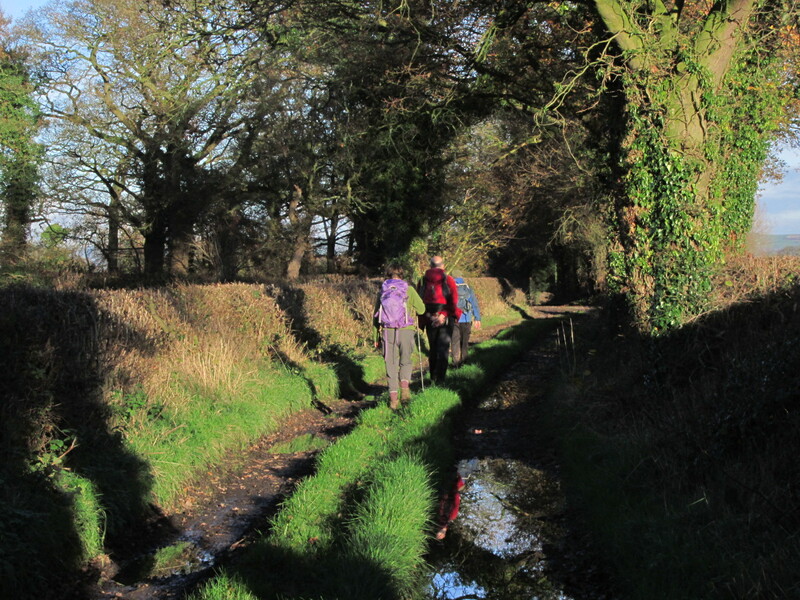 After a wet night, the Ramblers set off from Little Moreton Hall along the South Cheshire Way. Soon after crossing the Macclesfield Canal the group ascended towards the Old Man of Mow. The summit however was just within the cloud base, and so on this occasion, only the grey outlines of both the Old Man and nearby Mow Cop Castle loomed out of the mist as mystical grey outlines, and there were sadly no views from these high vantage points. A descent was followed via a maze of lanes through Mow Cop Village, which is famed for the birthplace of the Primitive Methodist movement. 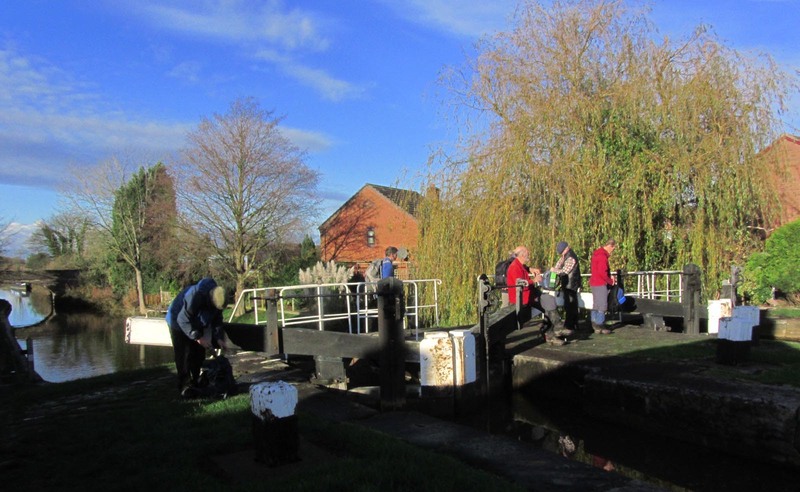 On the edge of Kidsgrove, the group then followed a section of the Trent & Mersey Canal to reach their lunch stop in the church yard at Church Lawton. The church which stands on a mound has been a religious site for near on one thousand years. The present church was built after a fire in 1798. One hundred and forty six years earlier the church was struck by lightning killing eleven people inside. Rejoining the canal towpath again the group crossed Snape’s Aqueduct to reach Thurlwood. Here it was time for another brief break before setting off along field paths in bright afternoon sunshine, following once more the South Cheshire Way for much of the way back towards Little Moreton Hall. Situated on the Manifold River, and above the River Dove valley, the village of Longnor provides a good starting point for walks exploring the upper reaches of both rivers. 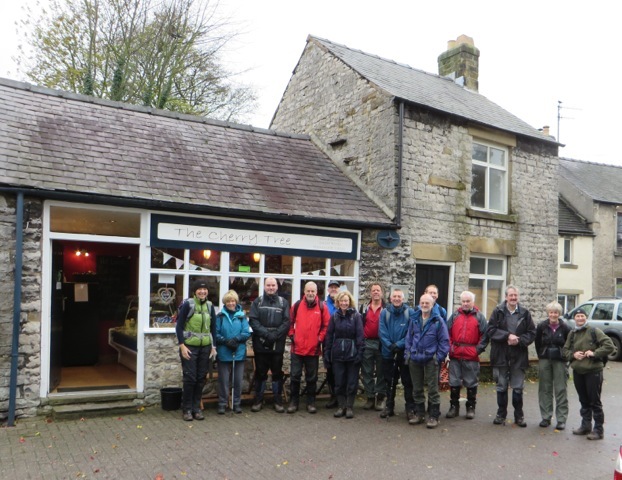 Ten East Cheshire Ramblers gathered in Longnor’s cobbled market square on a chilly morning for a recent ten mile walk south along the Dove Valley to Pilsbury Castle. The chill lessened as they gained their stride, walking down into the Dove Valley. 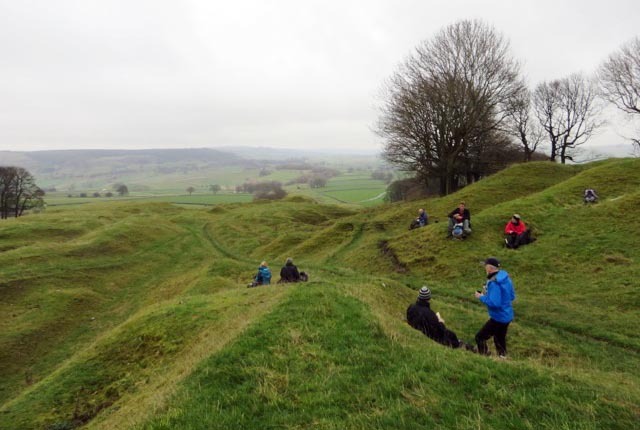 The morning coffee stop was taken at Pilsbury Castle, where earthworks and an earth mound on a limestone outcrop are all that remain visible of the Norman motte and bailey construction with a wooden perimeter wall, built in the eleventh century to control the upper Dove Valley. From here, through a haze of thin white mist, could be seen the distinctive grey outlines of Parkhouse and Chrome hills, – for their shape, also known aptly as ‘dragon’s back’. Their route, led by Mike Bull, crossed sheep pasture limestone uplands to reach the High Peak Trail, which follows the course of the old High Peak railway, constructed in the nineteenth century to link the Cromford Canal on the eastern side of the Peak District with the High Peak canal on its western edges, and with Manchester, then a rapidly developing cotton manufacturing centre. Good views of the hills were enjoyed as they made their way along the flat track bed, stopping for lunch at picnic tables at Sparklow, which had been one of the railway halts. The Trail took them back towards Earl Sterndale, where a wooden bridge crosses the Dove. This was followed by a short, steep ascent out of the valley back to Longnor. 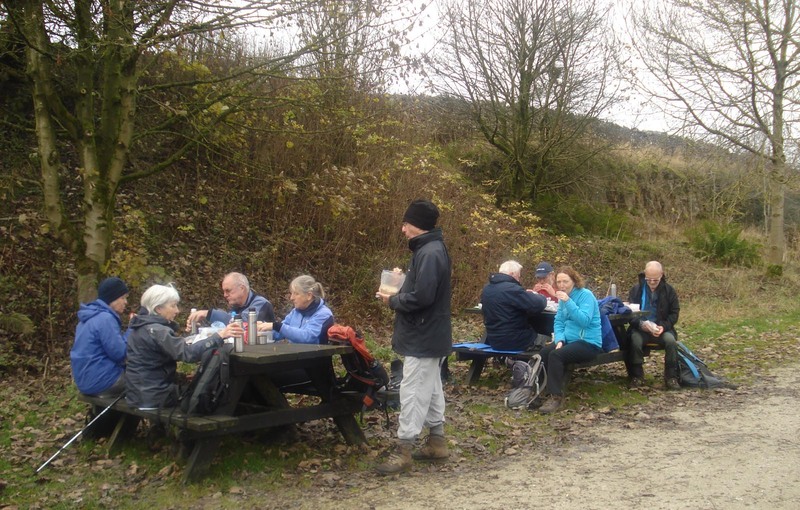 Some of the group lingered over well-earned hot drinks and cakes in the market square café -another attraction in starting the walk from Longnor – before their return home, contented with the tranquillity and beauty of the ramble. 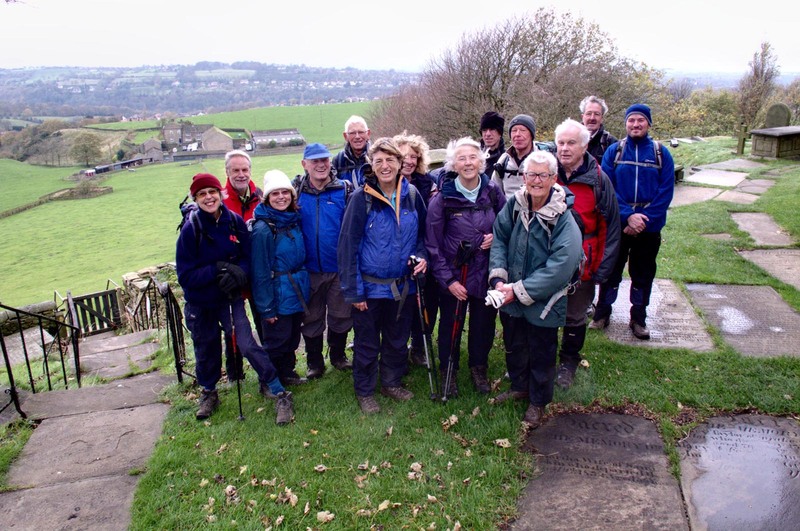 Eyam, a picturesque village in the Derbyshire Dales, was the start point of a recent walk by eighteen East Cheshire Ramblers. Known as the “plague village”, Eyam is famed for the fortitude of its villagers, who isolated themselves to reduce spread of the bubonic plague outbreak there in 1666. Fortunately, the downpour that greeted the walkers on arrival in the car park ceased by the time they set off, led by Ken Hobbs, to climb past a herd of bedraggled alpacas to Eyam Moor. Low cloud obscured their expected vista, but occasionally the sun broke through to throw a spotlight on the village of Hathersage below. They continued to Grindleford Station before climbing up through the National Trust Hay Woods, accompanied by the sound of cascading streams. On reaching Froggatt Edge the ramblers were rewarded by views of startling rock formations, backlit by a low sun breaking through clouds. There followed a zigzag scramble downwards through Bee Wood to Froggatt Bridge, also dating from 17th century, where they re-crossed the Derwent. Finally, they climbed from the river to pass “Riley Graves”, the resting place of John Hancock and six of his children who died within a week from the plague. Eyam Church clock was striking three as the ramblers passed by to complete their 11.5 mile walk. 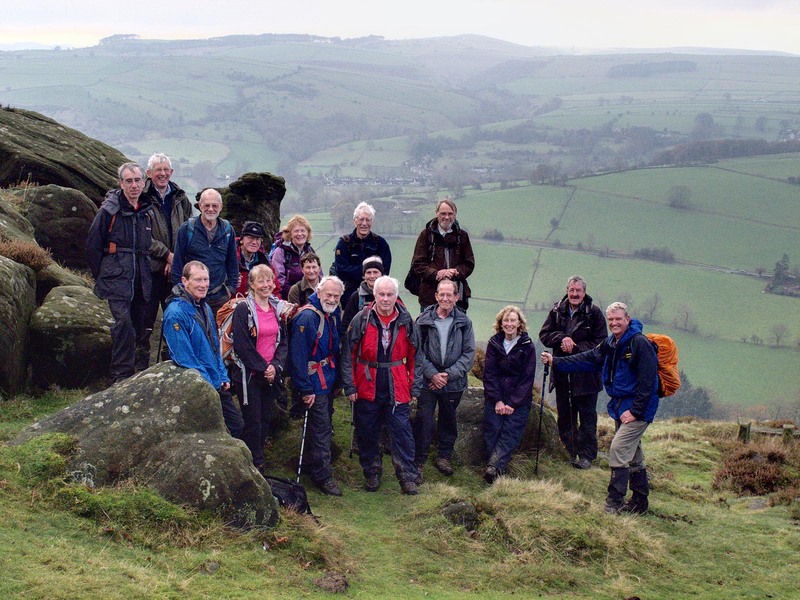 Fifteen East Cheshire Ramblers recently enjoyed a 10 mile walk which started in the pretty Derbyshire village of Tideswell. The village is one of the most ancient settlements in the central Peak District and was recorded in the Domesday Book. However, Tideswell is perhaps best known for its magnificent 14th-century church. The Church of St John the Baptist- often referred to as “The Cathedral of the Peak”, was built on the wealth created when the village was the centre of the wool trade and lead mining in the region, the latter very much in evidence on the walk. The leader, Caroline Finlayson, chose a route, which climbed steadily out of the village along narrow lanes and tracks onto Tideswell Moor. On reaching the prominent TV mast the path meandered through a worked-out lead rake – or mineral vein – known as Tideslow Rake. This is an outstanding example of an opencut working of lead veins and is of considerable archaeological, historical and ecological value. 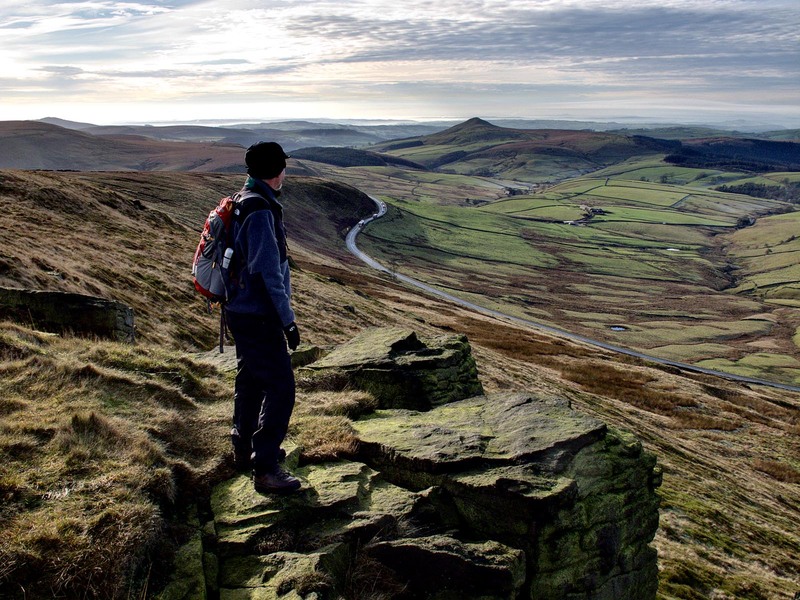 It is also a great place to stop for a coffee break and enjoy the views towards Castleton and Abney Moor. The walk then continued through the White Peak villages of Little Hucklow, Great Hucklow, Grindlow and Wardlow Mires. Later, their path entered Cressbrook Dale and passed the dominant limestone pillar known as Peter’s Stone. The stone stands in an area known as Gibbet Field, infamous as the place where the last gibbeting took place in the early 1700s. Walking through an area of such magnificent natural beauty it is hard to imagine the area’s dark history but gave an added thrill as they passed by. 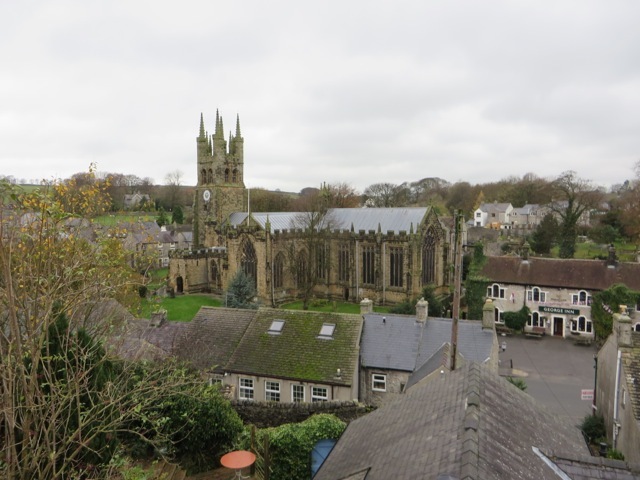 Finally the Ramblers returned to Tideswell, pausing as they walked downhill into the village to admire the pointed architecture of ‘The Cathedral of the Peak’ before heading into one of the local cafes for a well earned cuppa! St Thomas’ Church in the parish of Marple and Mellor is a fine, stone, grade II listed building. It contains a 12th Century Norman font and the oldest wooden pulpit in England, dating from the time of Edward II. Over the centuries, walls have been rebuilt, a tower and porch added, galleries constructed and then demolished, and the roof replaced. More recently, the screen was moved from the front of the nave to the rear creating a new chapel at the west end, and a new organ was installed in 1977. The Church was the setting for two minutes silence, when sixteen East Cheshire Ramblers commemorated Armistice Day on a recent eight and a half mile walk, led by Ann Thompson. 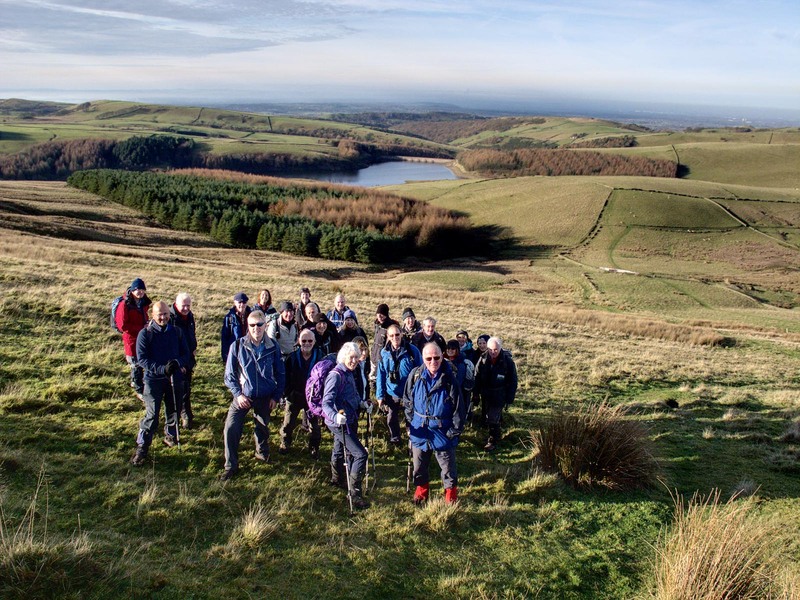 Starting near Hague Bar, and following tracks and paths on the Goyt Way towards Brook Bottom and Mellor, the walkers completed most of the walk’s 1,200 ft of ascent in the first twenty minutes! Their efforts were rewarded by a lovely view south towards Disley and the Macclesfield canal. With impeccable timing, they reached the south side of St Thomas’ Church just before 11 o’clock. Their silent reflections ended appropriately with chiming of the church clock, and were followed by a coffee break, enjoying the view over Mellor and Greater Manchester. At the nearby archaeological site, they learned that the Romans had introduced some features typical of an English garden, including roses, lilies, box hedging and lavender – and the common snail! 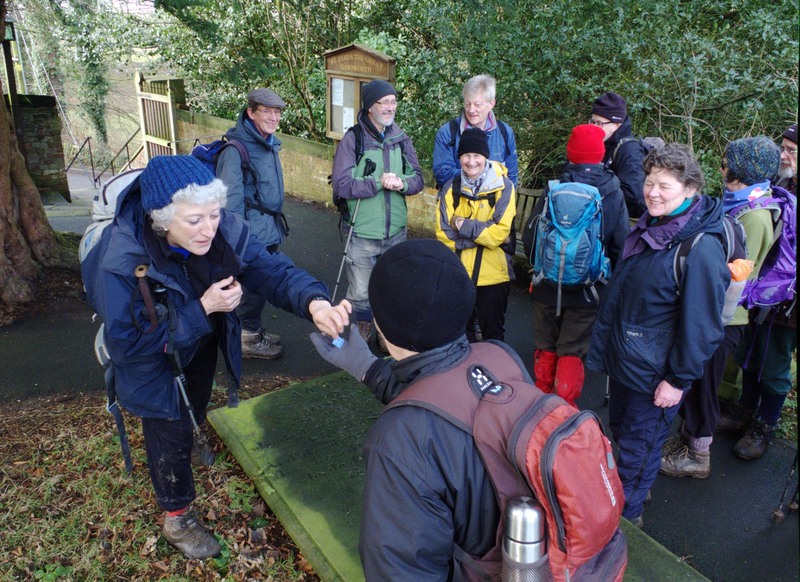 The weather was rather dull with occasional drizzle, but this didn’t dampen the spirits of the enthusiastic rambler group, as their onward route took them to the village of Thornsett, where they descended picturesque stone steps between houses, and onto the Sett Valley trail. 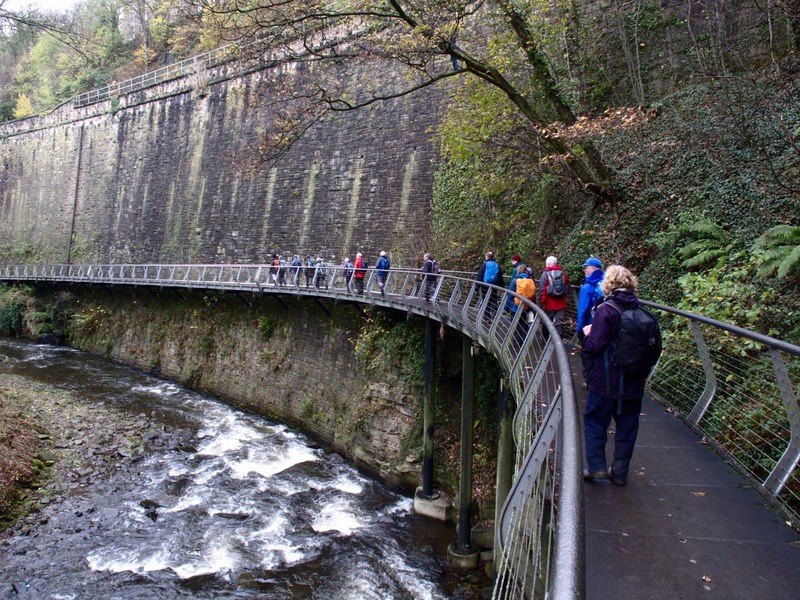 They continued to the Torrs Riverside Park, with its amazing gorge and the Torrs community owned and funded hydro-electric scheme. Past old mills, and along the impressive Millennium Walkway on stilts above the River Goyt, the walk finished along the river path back to Hague Bar.